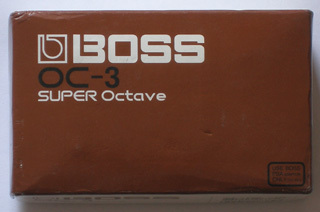 The OC-3, available since 2003, is the successor to the Boss OC-2 Octaver, with several improvements which make it a very different beast from the OC-2, while mantaining compatibility with it. It has two inputs, one for guitar and one for bass, and 4 control knobs. The first one, starting from left to right, is for the original instrument input level, while the second one is for the lower octave volume. The function for the third knob depends on the position of the fourth one, which is a three-position rotary switch. In the first mode (called “Drive”) the third knob is for distortion level. It should be noted that when using “Drive” both the original and lower octave will be distorted if using “Output (mono)” jack, but only the lower octave sound will be distorted on “Direct Out” output jack. 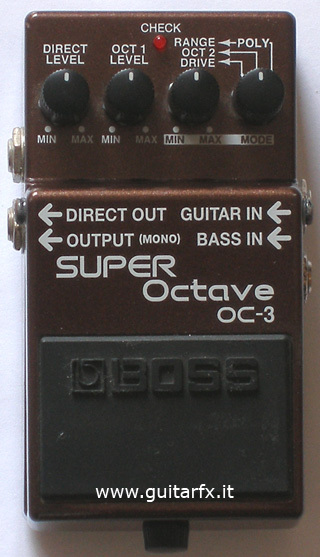 In the second “OCT2″ mode, this control is for the 2nd lower octave level, just the same as in the OC-2 pedal. In the third “POLY” mode, the control acts as a “Range” control: i.e. extends the range of frequencies on which the pedal applies its effect. This mode is also recommended if you are playing more than one note at a time.